This guide is for every woman who longs for a positive change in her life, not only financially. Being able to generate income by doing what we are passionate about is the ultimate goal for everyone. It does not have to stay a dream. This guide will show you how to identify whether your goal and your personality are compatible (is your dream realistic?) it shows you how to stay strong, what tools to use to make your business idea a success, and how to gain skills - if any lacking. The main message is "You can if you want to". Testimonies of women who are now financially independent, and lead fulfilled life speak for themselves. This is an extremely encouraging book that presents you with all aspects of a successful business startup. 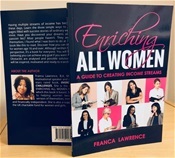 The author shares her success story, but she does not leave it there..her vision set in Enriching All Women Programme (Chapter 13) is absolutely amazing, and I hope many, many professionals will sign up for it. Best book ever! The testimonies are so real and informative. I really enjoyed this book. All the different kind of women are represented in this book. The unemployed, self-employed woman and the woman in low-paid jobs. I love the examples you gave. Especially the one about the couple with the unemployed wife and the man fell critically ill and the woman ended up working as a CS assistant to provide for her family. You emphasised planning the finances and making sure both couples work incase something goes wrong in future. I thank you for writing this book. The book is like an eye opener. I really enjoyed it. Thank you.